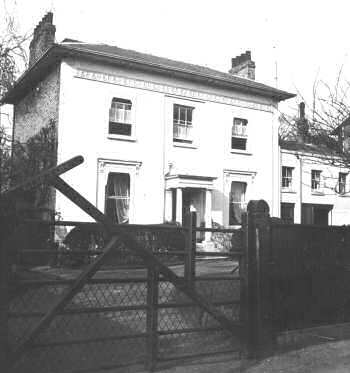 Clifton Villa, 45 Blackheath Park (formerly 1 Park Road), an attractive detached house built in 1826. A short flight of steps leads to the central front door and porch, the adjacent Coach House can be seen on the right. First occupied by a merchant, James Kemp, the second occupant was George Stephenson, nephew of Robert Stephenson, the railway pioneer. Part of the Cator Estate. Photograph taken in March 1938. Copyright: Trustees of the late Alan Roger Martin.